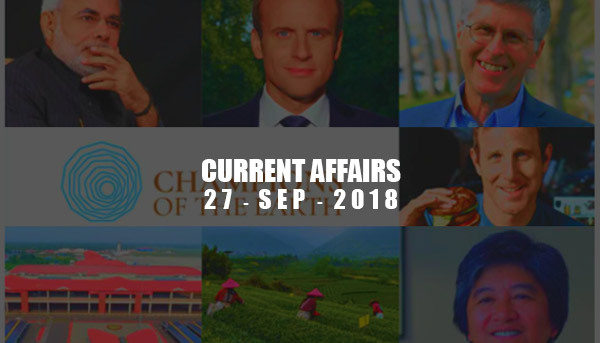 Current Affairs - Sep 27, 2018 - IAS - Daily Current Affairs, IAS Syllabus Exam Strategy, IAS Preparation. Indian Prime Minister and France President selected to be awarded highest UN Environment award - Champions of the Earth for their International Solar Alliance Initiative. Cochin International Airport is the world’s first solar-powered airport. It runs its entire operations on solar energy. This award was launched in the year 2005 by UNEP to recognize exemplary individuals and organizations whose actions created a positive impact on the environment. The Supreme Court on 26 September 2018 agreed to live-streaming and video recording of court proceedings. The verdict was passed on a batch of petitions filed by, law student Snehil Tripathi and NGO ‘Centre For Accountability and Systemic Change’ on the issue. GSTN 100% share acquisition by Govt. Union Cabinet has recently approved increasing the government stake in GSTN to 100 percent from the current 49%. Currently, out of 49% stake owned by govt Centre and states own equal halves. The acquisition of the rest 51% from five non-government institutions will be made by the Central and state governments in equal quantity. The Cabinet also decided to allow a change in the existing composition of the GSTN board. New GSTN board will have a total of 11 directors including a Chairman and a Chief Executive (CEO), 3 directors each will be nominated by the Central and state governments, 3 other independent directors would be nominated by the board of directors. GSTN provides the technical support to the GST by handling massive amounts of data and deals with crucial data sets such as indirect tax returns and refunds. Astra, indigenously developed Beyond Visual Range Air-to-Air Missile (BVRAAM) successfully tested from Su-30 aircraft. This best in class weapon system comprises a launcher and a missile and having a long range of 110 km and short range of 20 km. It is a mobile application launched by the Finance Ministry as a part of Financial Inclusion. It is jointly developed by National Informatics Centre and Ministry of Finance. The app provides a citizen-centric platform for locating financial service touch points across all providers such as banks, post office, CSC, etc at a given location in the country.